Rose Parade – Impeach Obama Sky-Banner | Stop Obama Now!! 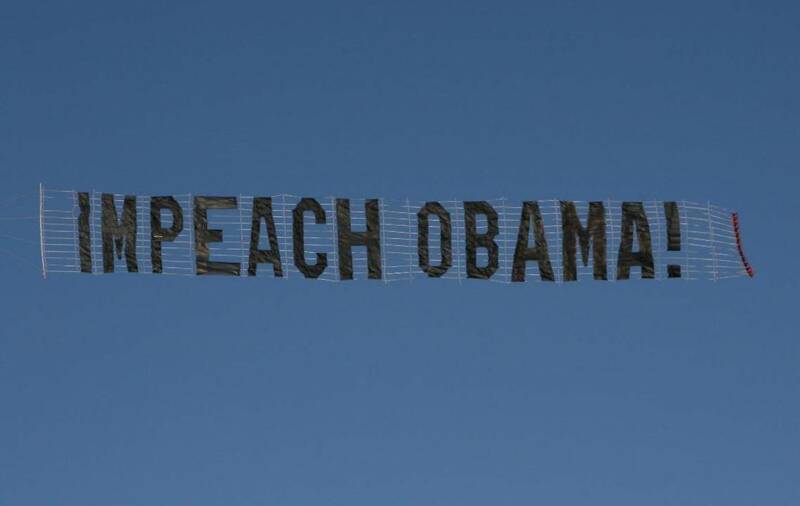 In this event a sky-banner reading “IMPEACH OBAMA!” will be towed around the route of the Rose Parade and over the freeways of downtown Los Angeles on the day of the parade, January 2, 2012. FAA requirements are that the plane stay 3,000 feet above the parade route, but we will be towing a sign with 12-foot letters, much larger than normal, which will be readable for over a mile. If the ad-provider can work a deal, there is also a chance that we can do this with sky-typing, which is visible over an area with a diameter of 10 miles!! More than one million people are expected to be along the parade route, including many foreign visitors and media. This is a great opportunity to completely bypass the media and let the public know that we want Obama, exposed and removed from office. But if it does get into the media, there is also the possibility of the message reaching the 10’s of millions of television viewers. The cost of the ad will be around $2,500 for three hours. The pilot is asking for more than the usual fee (~$1,500 for three hours) because of the very large crowd and the event takes place on a holiday. To make a contribution, click on the button below. Suggested contribution is $10-25 dollars. It is certainly okay, of course, if you want to pay more, but small donations are also appreciated and they do add up. Credit Cards are accepted. It may be a few days, before a mailed contribution is posted. Your money can be returned via PayPal or mail, if the flight does not happen as planned. In case of a problem such as bad weather, the ad-contract will specify that the flight will be flown at a later date. Will negotiate that with the ad-provider. If you don’t trust the organizer, you can always reverse the charge on your credit card as being fraudulent. So, there is no risk of losing your money, if you pay with a credit card. This is the list of contributors to date. Ordinary folks from all across the country are funding this event. If you don’t want your full name listed, you can identify yourself by initials or a user nick. Just send a message to “sonsandiego@gmail.com” and let us know. Whether you believe that impeachment is practical at this time or not, this event is a protest of the media bias surrounding the corrupt Obama regime. We feel that the media has practiced a huge double standard. Criticism of Obama is suppressed by the corporate media as well as generally in society, due to political correctness and even appeasement for fear of social unrest and/or retaliation of some kind. This is a chance to voice our disapproval in a way that is difficult to ignore and there is benefit to that, in itself. It is said that in times of deception, the truth is subversive. This is very much a time of deception. The truth is that many people think Obama is unfit for the presidency and even dangerous, due to his anti-American background. His actions while in office have only confirmed that wide-spread belief in many ways. He should be removed from office as soon as possible. This is a way that we can make our message heard without the censorship of the corporate media. We have now achieved our fundraising goal! If we receive more contributions than the cost of this flight, the excess will be applied to the next flyover. We are considering flying a sky-banner at the Super Bowl in February. If you send a contribution via PayPal or send your e-mail address with your contribution by snail mail, you will be added to our e-mail distribution list and receive updates about additional upcoming events. This link describes the sky-banner that we did on Veterans Day over Coronado Island. These groups and organizations publicized the event early-on or helped otherwise promote the event in some way. It helped with fundraising and the corporate-controlled media, of course, would not mention it. The Cost of the banner will be paid entirely by individual contributors, ordinary citizens from the San Diego / SoCal region and from across America. I sent this far and wide…..and I’ll be sending in more dinero!!! Fly it high and keep it going!! This type of message should be carried out in every state for every sports or national holiday occasion, except Christmas until this freak president is long gone! Contributions over the last couple of days have been encouraging. Hope we can keep it up. The Rose Parade is a great opportunity to reach a lot of people. Skywriting is a way we could get a message out to a lot of people. It costs a lot more than towing a banner, but if several groups print different messages at the same time, they can share the costs and it becomes a lot cheaper. The ad-provider is trying to work a deal with several groups. Sky-writing can be seen within a circular area 20 miles across!! I have written down your address and I will be sending you a check. I think it is great that you are doing this and exposing Obama. Some people may not know how bad he is for this country. Thanks, Nancy. All of the money will be used for this or another overflight. Post it on FB again so I can send it forward! PLEASE fly that banner BIG AND PROUD over Indianapolis for the Superbowl 46!!! People need to see and acknowledge how serious America is about removing the parasite president and his crony crooked libs from DC!!! Obama must be stopped and replaced by a reputable leader who will put our country on the right track according to the Constitution!! Julie, we are with you on that! I believe he must be exposed and discredited, not just voted out, which makes him seem legitimate and sets a horrible precedent for the future.